One thing few people know about me is that I'm a Transformers fan. But to be more specific, I'm what you call a G1 fan (Generation 1) or in layman's terms, the very first issues of the Transformers when it was commercially released in the US around 1984. It's that specific, because Japan released the Transformers (as diaclones and just the toys without any storyline or background behind each robot) before the US even adopted it and turned it into a cartoon. Since then, there have been several generations. There's G2 (Generation 2), Headmasters, Targetmasters, Destrons, Beast Wars, Minicons, Animated and many more I fail to recall. 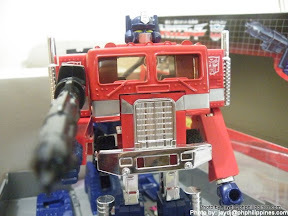 One of the most common characters in all generations, be it in a different form or variation each time is the character Optimus Prime, who is usually the Leader of the Autobots (the good guys). If I'm not mistaken, this character has been the robot with the most toy releases and variations ever. Last Christmas, courtesy of sweetie, I got my most prized Optimus Prime possession, the original and classic G1 release. I used to have a miniture replica when I was little, but it got washed away by a flood many years ago. It's just awesome. hahahaha ! I guess that's why only a few know of my collection... until now. LOL! I'm sure my colleagues sa music industry would never guess. Glad you loved it! Imagine I had it with me for almost a month already before giving it to you for Christmas. I was so excited to give it to you! But I did get help from best friend's Tappy's hubby in choosing the gift. Teehee. Halimaw sa collection! Shrine nga talaga to! Huwaaaaaaaaaaaaaaw! wow! optimus prime fanatic ka pala..